Meanwhile, I should be cleaning and packing, but I am still sitting here. I had a nice and quiet chinese new year eating lots of home made food. I have been busy with this and that...there are still work lying around. But I managed to finish up a few things that I've always wanted to do. 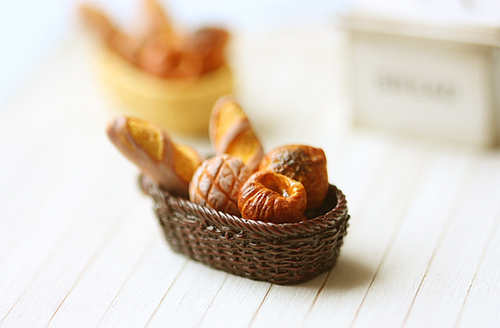 I had these resin bread baskets lying around for a while and had always wanted to make a french bread in basket pendant. I finally had the time to finish it! I even had my aunt to make them into necklaces. Length of necklace can be adjusted to your own liking! 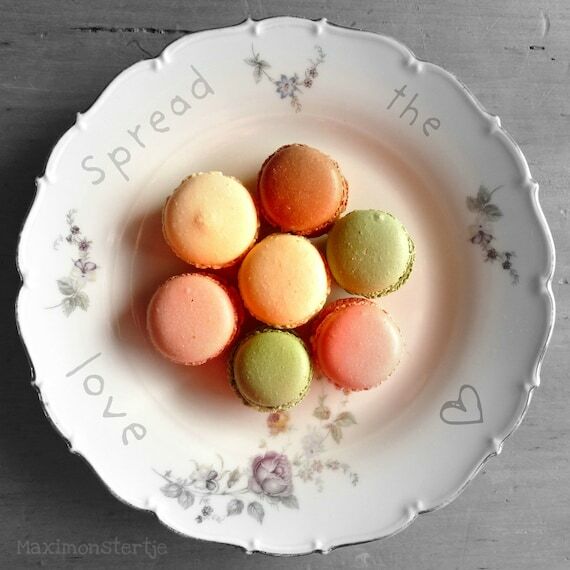 Thank you all dear readers, who left me such encouraging and wonderful comments about my life size inedible macarons in my last post! I'm feeling very loved and actually I have some ideas on how to transform them into functional gifts...so do stay tuned! I've been spoilt by my dear friend Jacqueline ;) I received this fabric macaron keychain in the mail earlier this week :) I also received a lovely sweet lemongrass essential oil. My favourite scent at the moment is lemongrass! Today's Chinese New Year's Eve, and for those of you who are celebrating it, I wish you a wonderful and prosperous Dragon Year! I took these photos a while ago, but I couldn't post them earlier as it would spoil the surprise for my sweet friend..so I waited till Jacqueline received them before I decided to post this. Remember in one of my earlier posts, I mentioned finding a rare treasure while shopping. It made me really excited. When I got the french container itself, an idea came to my mind. It was just perfect for some macarons. But since I don't bake, I was going to try making some fake life size macarons to display in the container. If you have been following my blog, I don't sculpt too many life size items. This was my first attempt. But the thought of beautifying the french container was constantly calling out loudly to me, so I finally gave it a try. 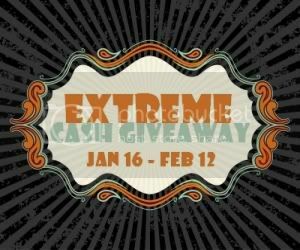 You ONLY need to enter this giveaway on one of our blogs. 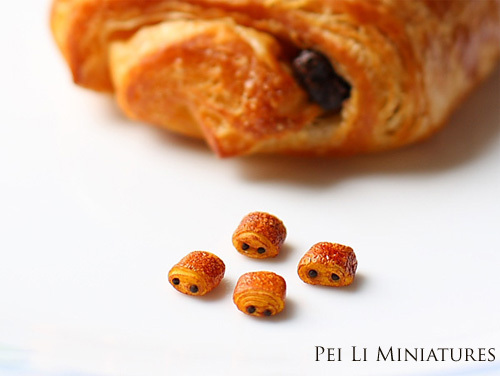 I started making some dollhouse miniatures Pain au chocolat lately. But the truth is, I have not eaten one in a long time even thought it is a favourite food of mine. I don't pass by the french bakery often and even the Japanese bakery don't make them as well. I guess that's why. I always like to eat mine hot and warm from the oven, how about you? Even if I leave them overnight, I would toast them the next morning before I eat them. It was my first time making these 1:12 scale Pain Au Chocolat, but am loving them! It was fun to make and I am seldom hungry while making dollhouse miniatures food, but this one made me yearn for a real one! So when I finished making them, I said that I would get a real one to treat myself. These round little cakes presented on a stick are so much fun to make in dollhouse miniature scale. I made them in many colours and I also made them in different types -some with sugar coated, some with coconut flakes coated on them :) and some sugar glazed. I don't think I'm done yet - in making them in different colours. So I will continue to churn out in different shades of colours, just because I'm enjoying making them so much. These dollhouse miniatures are lovingly handmade by me. Hope it brings a smile to your face! Fake sugar granules are also available in my store here. Hort Park is not a new place in Singapore. I think it's been around for at least a couple of years - maybe 3 I guess. I remembered because I was then working in my ex company which was nearby. Back then, I don't really feel like hanging out near my work area after work or on weekends, hence I did not visit it...until recently. I remembered I was on a bus that passed by it a while ago and it struck me that I DO really want to go and visit. Text-ed my high school/secondary school mate Maggie whom I knew had visited before and I asked if she would like to go with me. Hort Park is relatively unknown to tourists. When a tourist thinks of Singapore, they would think of the Zoo, Botanical Gardens, Chinatown, Little India and possibly other touristy places. Unless you are really a nature lover, and really want to go to all the nature places in Singapore, then Hort Park might pop up in your research. With that said, I would definitely recommend and bring my overseas friends here for a visit IF they are into flowers, nice gardens, beautiful landscapes and quiet nature. As described in their website, Hort Park is a one-stop gardening hub that brings together gardening-related, recreational, educational, research and retail activities under one big canopy in a park setting. You can even pay to learn to farm. I saw a few people doing that! It takes a little walk to get into this Hort Park, but it was nice. The air was fresh and invigorating that morning. The wind was cool, it was a beautiful day. It must be the negative ions. Maggie told me about negative ions and the good things about it :) That's why I love walks, gardens and flowers. Near the entrance, I was immediately attracted to this cute seat! Can't resist taking this photo! A christmas flower arrangement! Love the wood planter. The main building has a customer service office. In there, you find products for sale. Plants, bags, some souvenirs can be bought there. Another really interesting thing to me was a "showroom". The showroom was segmented into a living area, kitchen, dining, bedroom, study, bathroom area. What it aims was to show the public how you can make your living surroundings more nature friendly. It was really interesting to see how they decorate the area with plants, fish tanks and with some other innovative, stylish ways. I think the park had something special for Christmas. I saw they have kept most of their christmas decorations in the warehouse/store area. I MUST remember to visit this again next year near Christmas time to see what they have specially put up for Christmas. Over in the dining area, the Christmas dinnerware and decorations were still on the table. We left the showroom and started wandering around the area. I saw these plants that lined the wall as we made our way to the basement area. I was upset though, when Maggie said there used to be a flower shop in the basement, I would so love to visit it! But I think business had been bad and so the flower shop is gone. All that is left are just some function rooms, where people can hold weddings or function/events there. We passed by and saw a few very pretty walls like this. We then continued our walk into the park. It was nice to see how they segment it into different themes-Chinese, Balinese, Peranakan etc. We passed by this place where it looks like a greenhouse. Maggie told me beforehand that nobody can enter it, but you can look through it and see all the beautiful flowers in there. We saw a staff outside and asked if we could enter and he said yes. We found out it was a butterfly garden! There were just many flowers and butterflies inside! Many people came here too. This is the most busiest place actually. We spent quite some time inside here. Don't know why, but I think there is something calming to see butterflies flying all around. Pink flowers make my day! We then walked to the greenhouse. Along the way, Maggie told me the plants in the greenhouse were going to be transported to Gardens by the Bay which would be opened soon in June 2012. I read from the internet that it was as big as 101 hectares or 177 football fields. Would you believe that? I'm really excited now and I would want to visit there when it's opened. We saw a few green houses and even though we can't go in there, but we stood outside and marveled at the different species of flowers. Some of the green houses were cold (air conditioned) which was necessarily for some of the plants that can only survive in cool climate. I tried taking a photo of this pink flower from the outside of the green house. We made our way back to the entrance, where we rested our feet and then continued with the walk. We walked up the suspension bridge and was going to embark in another walking trail. However, part of the bridge was closed due to repair works so we could not continue our walk that way. It would be reopened in late Jan 2012....so we said we will come back for this part of the walk when the bridge is re-opened. Would you like me to blog about Part 2 of the nature walk? Please write in the comment to let me know. Thank you so much! I hope you enjoyed this nature walk with me. Happy New Year everyone! May you all have a fantastic 2012! I have been thinking this for a little while, and wondered what is a better way to start off the new year? With a FREE giveaway of course! I've been very lucky to know Danny of Maximonstertje and was very excited to bring this giveaway to all of you. I love her beautiful, colourful art prints, which made me smile and I'm so sure you guys would be delighted to own them! These would be perfect to decorate your house! Or are you running out of gift ideas? These are also going to be excellent housewarming gifts or birthday gifts! This one is a special special favourite! Looking at it just makes me smile! New in the shop too! 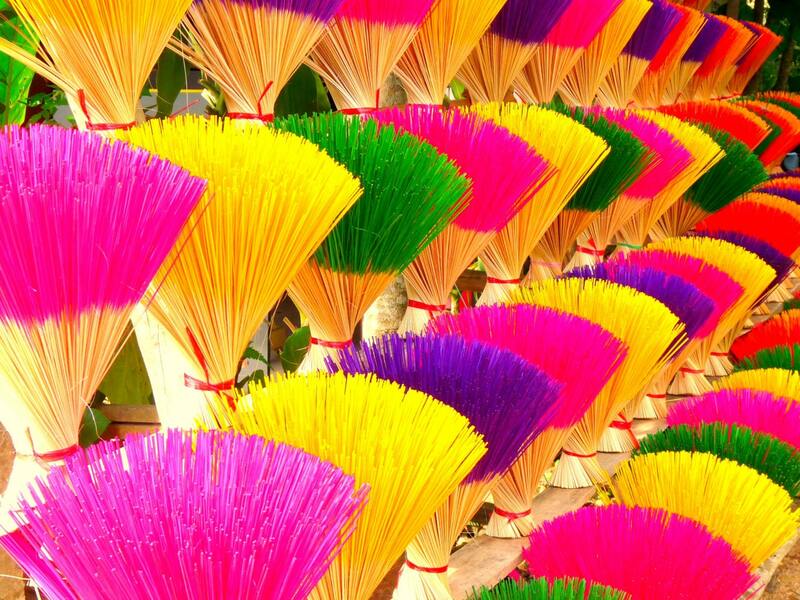 I thought these were fans, but with a closer look, I found out they were coloured incense. But the colours were so bright and colourful that I know this would be such an attractive happy art print to look at! 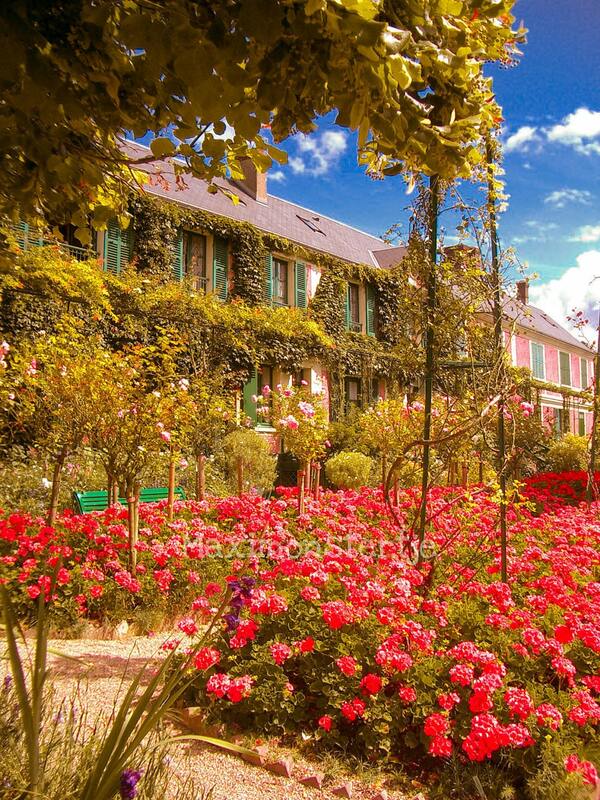 I've yet to travel to such a beautiful chateau or place where there are so many red flowers all around. I know that looking at it would bring me a sense of calm and happiness. When a winner is picked on the 24 Jan, I will contact you to let you know how you can contact Danny to pick and claim your prize. You have 48 hrs to respond. Another winner will be picked if there is no response/ no way that we can contact you.